Thanks for testing these so I can avoid! I stick with Neutrogena and Bioderma. I just stick whatever I have in the house on. I quite like dry oils but thats about it for my preferences. 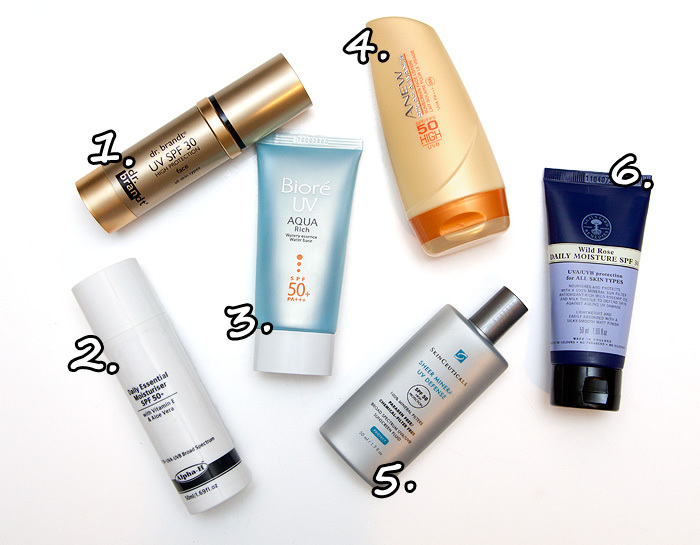 Is there anything else we should be looking out for other than the SPF value? And why were professionals so unforthcoming? Did you speak to company reps or dermatologists? I was using Neutrogena Multi Defence SPF 25 but it is a bloody nightmare. It quite quickly flakes off into little balls and you have to wait an age to avoid this happening as you apply foundation… Also to avoid the flakies you have to apply very little so you’re probably not getting the SPF on the bottle. Just one to add to the list if it helps anyone! I heartily support Neal’s Yard for the winner- it is lovely and well worth the extra bit of rubbing. I just used it whilst on holiday in America and it did very well in the 40+ heat! I felt okay putting it on my daughters faces as well, more for the moisturisation due to all the sun and swimming but the SPF was a bonus. Yeah, I was pretty disappointed that the series never happened. Maybe next time don’t say you’re going to do it till its almost done? 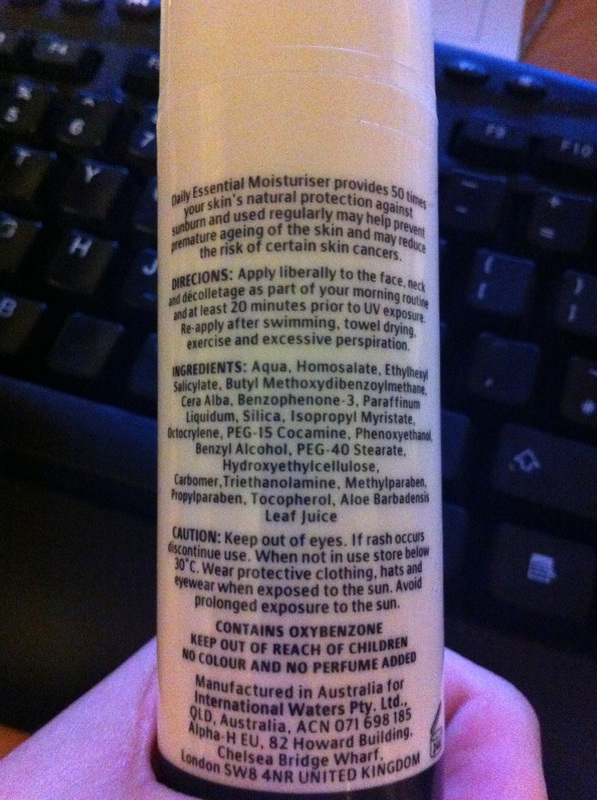 Anyway, what’s wrong with oxybenzone? Hi Rachael, I should have held back ’til completed but I really don’t have time to schedule my posts further than about 12 hours in advance. Everything you read during the day has been written some time between 9pm and 2am the evening before. You’re right – I think it means that I need to think a bit harder about commiting to ‘series’ of posts like that rather than just get over-excited in an ‘ooooh good idea!’ kinda way. I’m sorry that you were disappointed. As for oxybenzone, the EWG has an interesting article on the chemical. Of course, there’s always two side to every story but as I said, if there are sunscreen options that are free from potential hormone interruptors, I’m happy to use them! Thanks for this. I have been curious about the Skinceuticals one so I might try that at one point. I tested the Dr Brandt in SpaceNK today and it does feel rather nice but I am trying to avoid chemical filters. Ah, I was wondering what happened to the series! Thanks for the roundup and please do share some knowledge with you whenever you get the chance. I would rather get random tidbits here and there than nothing at all! Thank you for doing this – will check out the Neals Yard one when I’m next anywhere near a stockist. Rachael – aren’t you rude?! Maybe next time brush up on basic manners before leaving comments. Don’t worry when writing an article about “doing it justice” – just present the facts as they stand – both sides of the argument and let the reader decide for themselves what their own course of action shall be. You are not the Daily Mail – you are not here to influence people one way or the other – stick to the facts – well laid out with a few “quotes” if you can get them but there are plenty of research papers in the public domain you could refer to. I would definitely think that at least providing a few reasons why you are rejecting a product based on ingredients or a link where people can read more would be helpful – rather than leaving us hanging Then it’s our choice if we decide to use something with oxy-whatyamacall, find out more about it or just ignore it and continue to buy what we like. As long as there’s good content, a pros and cons or for and against and plenty of great pics which we know you do well then i’m sure you would do it justice anyway!